Oh my! 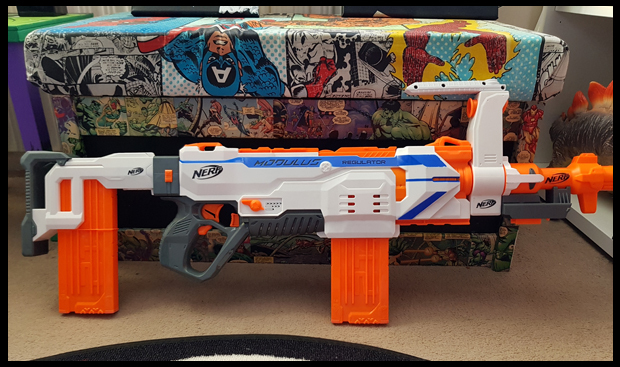 It is no wonder the Nerf Modulus Regulator is on Very's dream toys for Christmas 2017! This toy is mega fun! Yes, the whole family has had fun with this one. 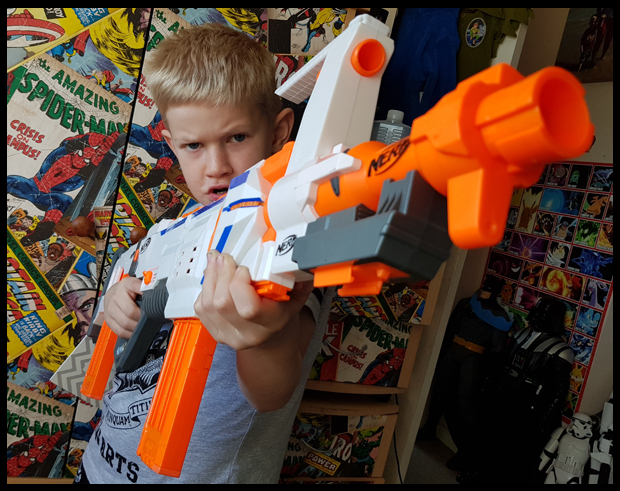 I know Nerf guns can be a bit of a controversial subject for some families, and toy guns are frowned upon, and that's fine, this post may not be for you. I have no issues with that, but some families, mine included do allow Nerf guns, we also have pirate swords and a great bow and arrow set from when we went to Warwick Castle, and it is all played with in good fun and moderation. For me, the Nerf Modulus Regulator is the ultimate Nerf gun. It is huge, it is the gun the whole household want to use in Nerf Wars and it is fast! When we received the Nerf from Very my first reaction was a complete surprise as to how big this gun is! This gun is very easy to set up, as with many toys there are wires keeping the gun in place, so if this is a present, don't fear it won't take long to open up and put together. I always feel like I'm a contestant on the Krypton Factor on Christmas day trying to get the toys out of the packaging! Ideal gift for any child who enjoys Nerf Wars and chasing each other around the house causing lots of noise and mess, OR for any child to take their gun around a friends house to leave yours in peace, either way works for this Nerf Modulus Regulator. The Nerf Modulus Regulator is the must-have toy from Very.co.uk and currently available for £55.99. 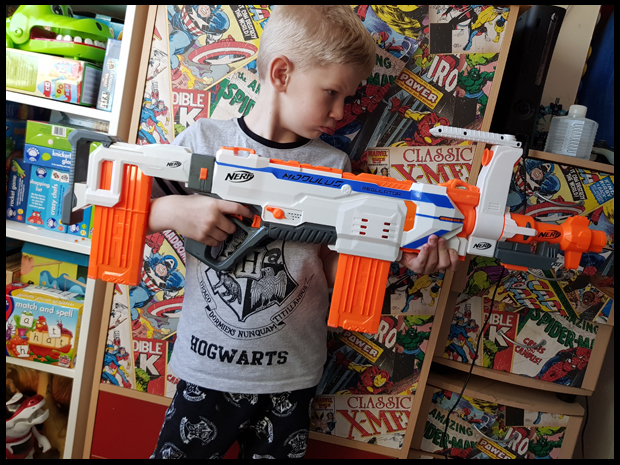 I can see why this is popular, this is the only Nerf gun in the house that my son will pick up now, it has 3 different options for firing out bullets and as you can see from above, has 2 dozen bullets to get through. The gun takes 4 C size batteries which do not come with the gun, so do make sure you have these on hand for when your child sees this, they're going to want to play Nerf Wars immediately I can image, you prepare yourself. Battle will commence. 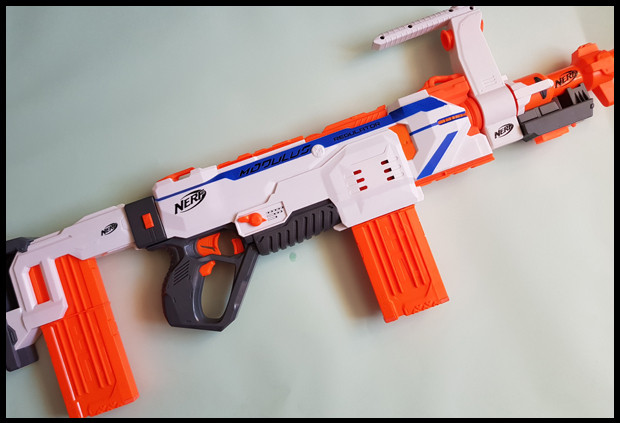 I received a Nerf Modulus Regulator from Very to review.